Should children be allowed to run around in church? When we arrived at our current church, a little over four years ago, our two children (then aged 4 and 2) were the only regular kids attending. Some weeks it was just the two of them – and other weeks, they had one or two friends join them – but, with such small numbers, they always had the run of the church. And, when I say ‘run’, I mean ‘RUN’. 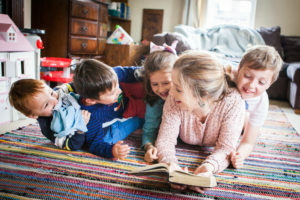 My husband and I were frequently both involved in any given service, and our kids hadn’t yet got to know the other adults well enough to sit happily on their laps – so we let them run. As our church started to grow, we realised that we’d inadvertently set a precedent. New families coming into the church only had our model to follow. It’s not that it was a bad model necessarily, it’s just that we’d done what we needed to, given the circumstances, and it hadn’t really been thought-through – theologically or practically. So now that we have four kiddoes (8, 6, 3 and 3), and our wonderful church welcomes nearly 30 children each week, the issue of what we should expect from kids during services is regularly on my mind. On the one hand – I love that our church is so welcoming and non-judgemental, and wish all churches were like that. (I’m aware many are, which is brilliant!) On the other – I wonder when kids should start engaging with the service, and how that’s supposed to happen when we haven’t developed that culture with them. 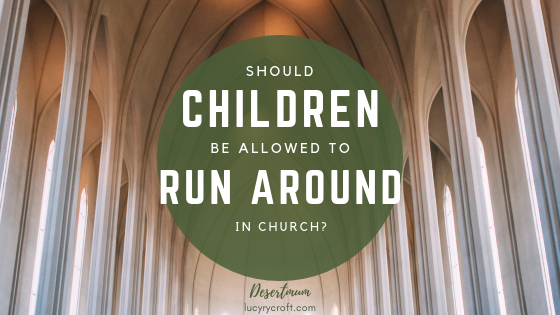 In response to the issue of whether children should be let loose in church, I’d like to ask, What would they be doing if they weren’t running around? This might also apply to older children with additional needs. These beautiful human-beings, who God created and loves and wants us to welcome graciously, may not yet have the emotional understanding or ability to meet the kind of expectations we might put upon other children. Are we to place impossible, stressful demands upon them and their parents? Quite honestly, if it’s a toss-up between a child roaming freely around church, or having a screaming fit because they’re feeling restrained in a pew – I’m with the first option. But here’s another answer: if the children weren’t running around, they might be actually engaging in worship. I’m speaking now of school-aged children primarily – children who do regularly sit still in class at school, and in assemblies. By allowing them to run amok, are we denying them of the opportunity to absorb Scripture through learning hymns and songs, taking part in the confession, and hearing Bible passages read to them? If we don’t allow our children to authentically engage in worship – first by observing us, then by taking part themselves, then by believing, questioning and really owning it themselves – what are we hoping for their futures? That they won’t know how to cope with services which aren’t specifically tailored to their age group? That they will never own their faith for themselves? It doesn’t sound very optimistic! I do think our services need to be free and relaxed enough to accommodate children in all stages of life, with all sorts of different needs, on all sorts of days, in all sorts of moods. But I also think that us parents have a responsibility to develop a healthy model of communal worship with our own offspring. A final answer: if children aren’t running around in church, they’ll be running around at home, at the park or on a football pitch. None of these options are bad – in fact, they’re all lovely ways to spend time. But ultimately it’s a joy to have children in our churches! Do we really want to lose them to other activities because parents have felt judged or frowned upon when they’ve come through our doors? Regardless of our own feelings, if our words and actions make parents feel uncomfortable and unwelcome when they show up, then they simply won’t return. Sometimes, we’ll just need to bite our tongue or smile when we don’t feel like it – but if these small actions help people to know God’s welcome, God’s love of children, and God’s huge desire to see them come to know Him, they’ll be worth every piece of our energy. Want to read more like this? Sign up for email updates and never miss another Desertmum blog! I’ll also send you ‘Ten Survival Tips for Newly Adoptive Parents’ absolutely free! Having visited your church it was very interesting to read the nuances behind what is seen there! It’s something I’ve thought about a lot with F, who during our 6 years attending church has grown from rampaging toddler to play-in-the-pew, busy-with-hands 8 year old (but will still indulge in a rampage now and then!). Our church has always provided ‘busy bags’ which I think was part of causing him to spend more time in the pew. Our children’s worker once commented on the rampaging by reflecting that ‘we all worship in different ways’, which I thought was lovely! She also felt as you do that a certain level of stillness is necessary to take part in the communal worship authentically, and among other things she then set up a toy area at the front amongst the rampagers to support them to settle down. I think another way some children might miss out on the communal worship is the opposite extreme – due to being transfixed by toys! I feel that your emphasis on modelling an authentic style of worship as parents is super helpful here. We might even feel youthful again as we join in kids’ action songs and get stuck into family prayer activities involving play doh, regardless of whether our kids are interested or not! each part of the service and a make and take activity for during the sermon The idea is that the parent/ carer guides the child through the service helping them access each part, giving them opportunity to encounter Jesus in their own way and context. Most often though the children just dig in as they are excited to get their bag. The Oder children go out to their own activities after the fist half of worship. Wow that sounds amazing! But quite time consuming to produce each week?